Vacation rental house. Sleeps 8, 2 bedrooms, 1 bathroom. Cats, Dogs allowed. Franconia's The Eaglet Log Home draped in Winter's white. 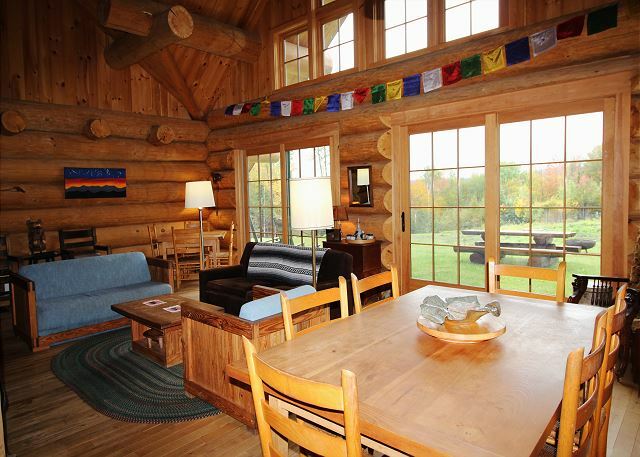 The Eaglet Log Home, fashioned & built to replicate the Appalachian Mountain Club Lodge experience, is yours to enjoy in private. Lots of windows, tons of natural wood and views beyond description... this is The Eaglet Log Home of Franconia Notch, a quintessential Mountain Country Home. The mountain views from this property are second to none all year around. 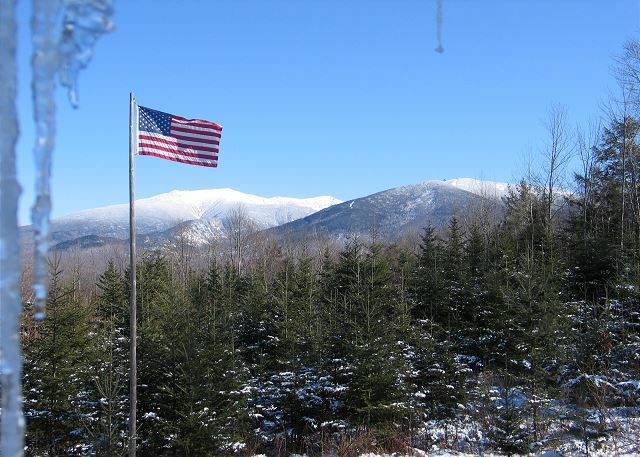 The Eaglet Log Home was also purpose built to take best advantage of it's location, with direct views to Mount Lafayette & lots more. 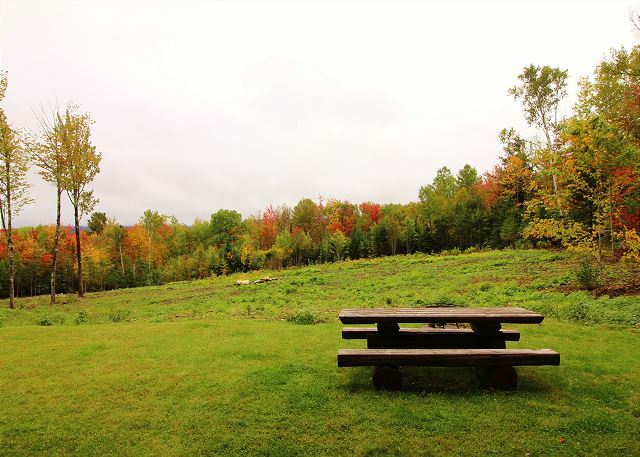 You're sure to enjoy the handmade picnic table during warmer weather. You and yours can gather around this beautiful fireplace at the end of long day of skiing or hiking; plenty of seating for all! The stone and woodwork of The Eaglet will leave you in awe! An open concept design, the dining area with seating for 6 is adjacent to the main floor sitting area, and there is also an additional smaller dining table for larger groups. The kitchen has all new stainless steel appliances and everything needed for a home cooked meal during your stay. Opposite end of the kitchen, here we see the second available dining table. 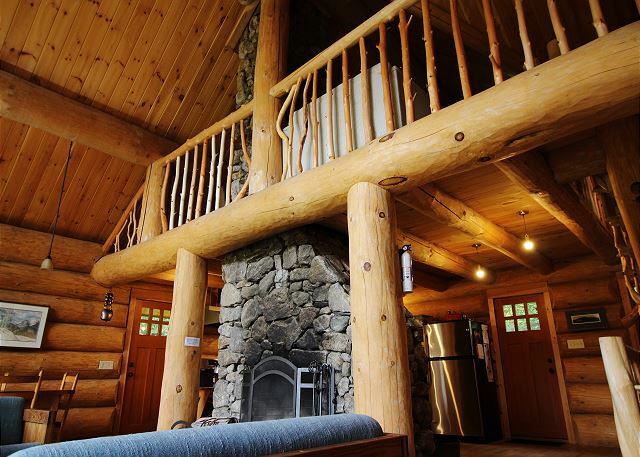 What's not to love about the rustic charm of this incredible log home? Bird's eye view of the main floor as seen from the loft. A full view of the "wall of windows". These let in tons of natural lighting and give you uninterrupted views of the mountains we're famous for. Bedroom #1 Master with queen bed and immediate access to the back deck. Heading upstairs, you'll never tire of taking in all the beauty this unique home has to offer. Loft living area with TV, DVD player, gaming system, as well as a selection of movies and games. Tucked away behind the sofa, you'll find an additional twin bed. Bedroom #2 "The Bunk Room" - with 3 twin beds and one double. Plenty of room here for the whole family! 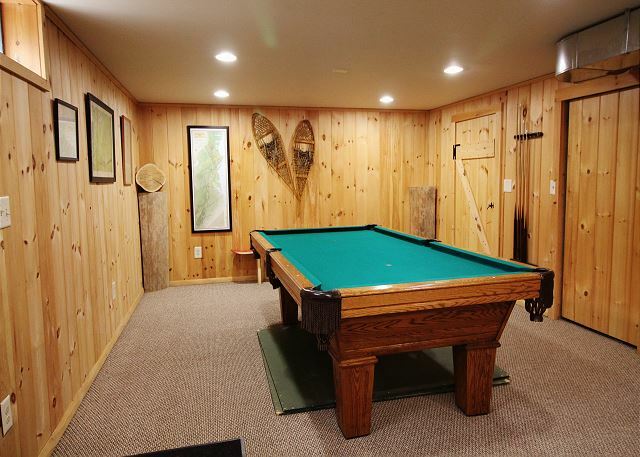 Basement level game room with billiards, foosball, and a selection of board games. 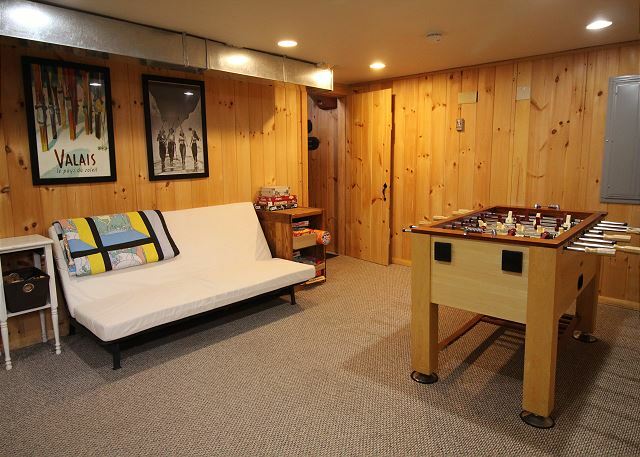 The basement/game room also has a small futon for additional sleeping arrangement. This was our 2nd visit to the cabin this winter and we loved it equally both times. 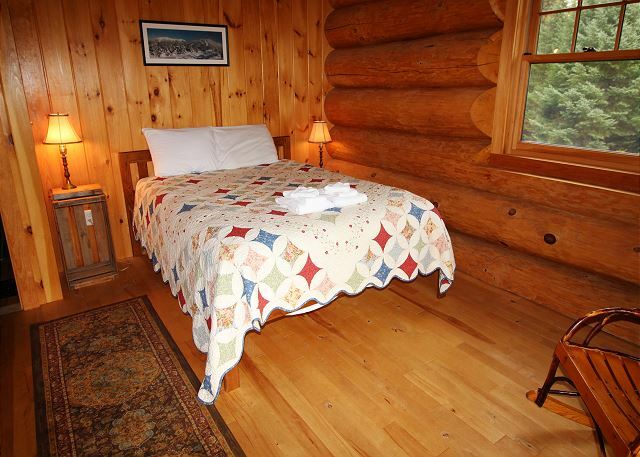 It is a charming and cozy log cabin, and is very clean and well outfitted. It has a view of the mountains that is hard to beat, a neat stone fireplace, plenty of firewood, games, puzzles - pretty much everything one could want for a nice winter getaway. Thank you! We had the most perfect time in this beautiful chalet, very well located and with all you need! Only thing is that there is only one bathroom. Great cabin in a great spot! This is an awesome cabin! My son and I spent a long weekend hiking in and around Franconia Notch. This was a perfect place to stay. 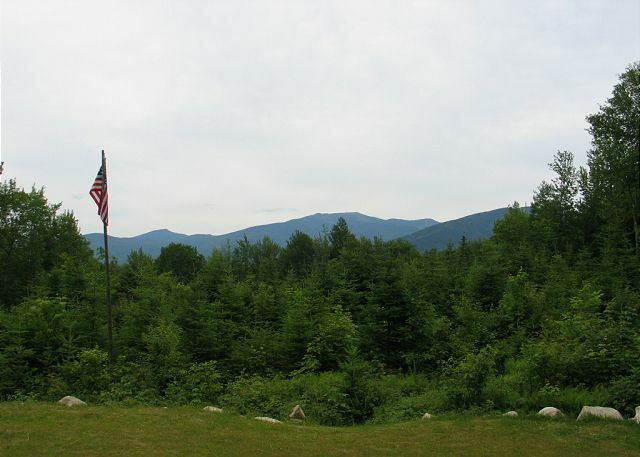 It is very close to the notch (and the rest of the White Mountains) but also very secluded and private. 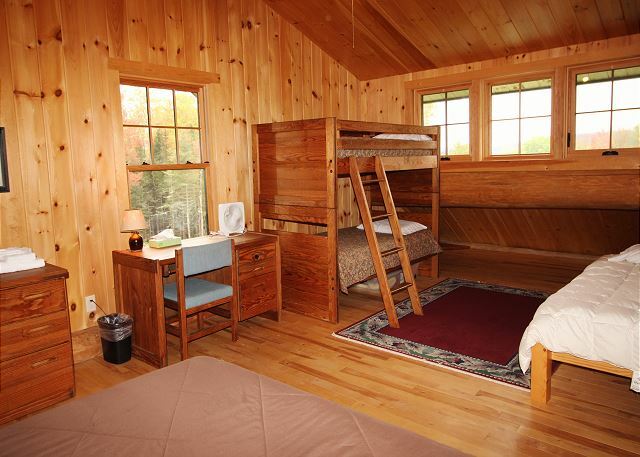 The cabin has everything you need to have a home away from home experience. We enjoyed our stay. It was a great place to relax and get away from the distractions of everyday life. Everyone loved the games and sitting by the fire. The only thing it could use is another bathroom and maybe some AC for hot days. I love that it's pet friendly- my Dane was in heaven. Cort Roussel was very accommodating, friendly, and very polite!!! I would recommend Franconia Notch Vacations to everyone I know who wants a getaway!!! I will always go to Franconia Notch anytime I need a getaway!!! Secluded log home with mountain views was awesome. No hesitation to stay there again with or without the kids. Kitchen was well stocked with dishes/pots/utensils and the place was clean. Be very vigilant for ticks around the yard, which is normal for NH. Also saw a bear on the road. Overall, very pleased with the property and experience. 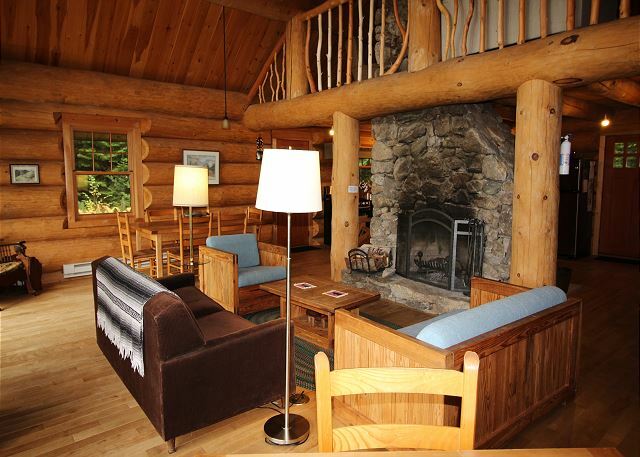 We rented this beautiful log home for five days during the 4th of July holiday. This home was very clean, cozy and conveniently located a short drive from Franconia Notch State Park and other White Mountain National Forest attractions. One morning, I had the exciting opportunity of seeing a black bear come walking through the back yard while I was sitting on the back deck having coffee and I was able to capture the whole experience on video. We really had an overall wonderful experience with renting this home through Franconia Notch Vacations and we are looking forward to our next New Hampshire vacation. 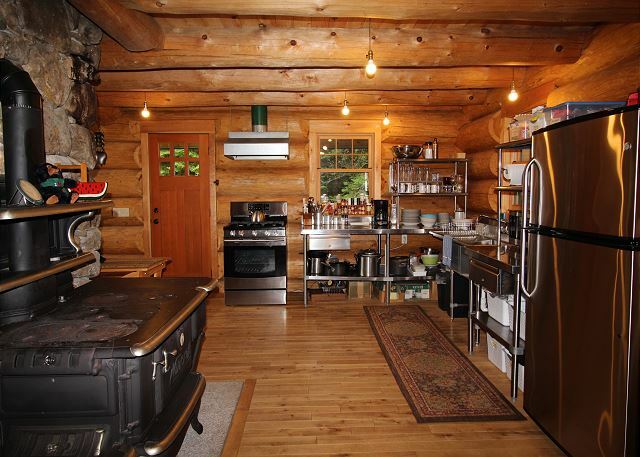 Amazing log cabin on a quiet, private lot. Close to everything in Franconia. 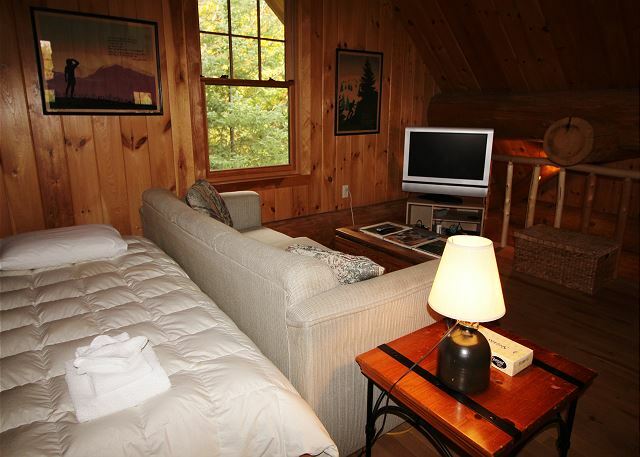 Beautiful cabin with a wonderful central stone fireplace and open floor plan with loft. Perfect mixture of rustic and comfort. Beautiful views. Great rental management company. This was our second year staying at The Eaglet, and it was another great experience. Words cannot describe what a beautiful home and area! Everything was clean, homey, and comfortable. Would highly recommend the Eaglet and hope to stay again some day. The only drawback was the fireplace was not functioning well and smoke detectors went off. Was told it was because of the weather, but didn't dare try another fire. Loved playing pool and ping pong! We took in Mount Washington Cog trip- fantastic! Also hiked the basin and flume. The flume was breathtaking! a guest from Blooming Grove, Pennsylvania does not recommend this vacation rental. Full of mouse droppings. Only one bathroom for a home that "sleeps" 8-10 & certainly not enough hot water for all to shower daily. House not finished; no yard. 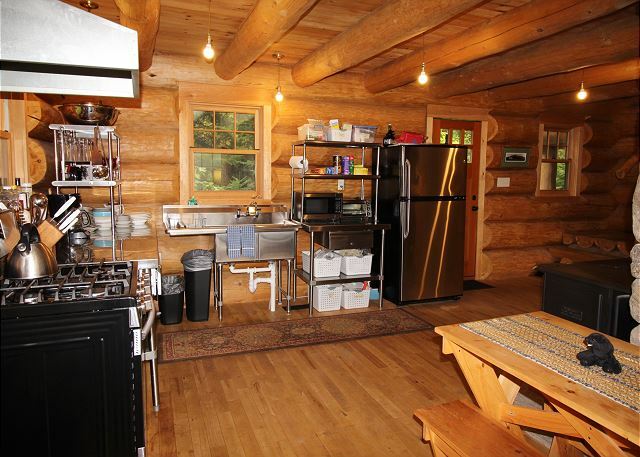 Eaglet Log Home is more like a Hut in the woods. Did see a baby Moose and that was great. As an FYI to those following this review... this guest booked on-line and had thought they had reserved an entirely different property. This guest's dissatisfaction began the moment they opened the door accordingly. As such, a portion of the 'disappointment' that is being expressed here surely ties back to this fact, and is not a real representation of the qualities of this home. As for the mice, we have to admit, they do happen, and regret that when they do. It's part of Mtn Country Living, while we otherwise work very hard to ensure the cleanest homes possible. Sincerely, Cort Roussel. Owner-Broker, Franconia Notch Vacations. The only thing missing was a hot tub and a good frying pan. otherwise the kitchen was well stocked and everything was wonderful. Could use a half bath 1 bathroom was tuff. We had such a great time beautiful log home very clean and comfortable love the privacy, we will be back. We love the Eaglet. A great place to enjoy family gatherings on vacation and very private. Our family of 5 had a wonderful stay at Eaglet. The home is absolutely beautiful, the beds are comfortable, and the kitchen had everything we needed (even spices and some dry goods which is really helpful). The kids loved the ping pong table and foosball. It is SO peaceful! Nearby hiking was tremendous. Cort at the reality office couldn't have been more helpful. We miss Franconia Notch!!! ;) Thx so much for the kind & generous words Anne. Such a great Family as yours deserved nothing less Dana, and so glad you "found" The Eaglet Log Home otherwise. It was and will be our pleasure to serve you all again sometime!! With much thanks. Sincerely, Cort. More than we expected! The cabin was immaculate, had plenty of room for everyone. The kitchen was great- we had fun cooking all of our meals in the AMC style kitchen. Gameroom, fireplace, views- couldn't ask for more! Spent a long weekend hiking with spouse and border collie in an amazing log home that definitely delivered on what was advertised. 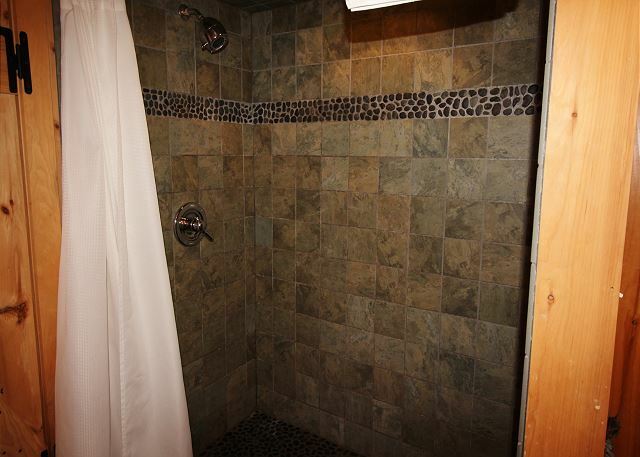 Easy to get to, convenient to Franconia center, and immaculately clean. We are looking to rent a week this summer as the first visit was not enough. ;), is what we are always aiming for... Thx always Mr. Lyons. We had just a wonderful time on our vacation. The cabin was wonderful and everything that we were hoping it would be. We definitely will be back. Good location for hiking, welcoming, clean, uncluttered, lovely views of Cannon and Lafayette, well-equipped kitchen, variety of mattresses and blankets to choose from, lots of games. The only improvement I would make is to the lighting in the living room. Reservation went smoothly; Payment, key pickup, directions, instructions, all renting logistics professionally handled. All-in-all it made for a very rewarding vacation. Me and my family had a wonderfull stay at the beautiful log home built with much detail n character . The home is In a perfect spot with a breath taking view. We will definaty be back. We would like to thank the owners for shareing there wonderfull home. We had an great experience at the Eaglet. Cort was awesome an responded immediately when we called him. The home is absolutely beautiful (my dream home) and the location was perfect. Our children stay at Mittersill but ended up at our place every night for ping pong, pool, darts etc. Pleanty of room for all inside and out. Thank you for sharing. Next year we are hoping to see a bear! This house is a dream. It may be my favorite place to stay, ever! If you love Morther Nature this place is perfect for you. Really wonderful spot, great house. Spacious - seven of us were very comfortable - although the single bath required a bit of planning. All in all, we'd go back tomorrow if we could. It was a beautiful property, even better than described! Very private location with gorgeous views. Great rental experience. the most amazing home we've ever vacationed in. clean, had everything you need for a great vacation. we all had a blast. thank the owners for us. we plan on returning next year. Nice cozy cabin in the woods - 2nd time staying. Nice place to get away to relax an not be disturbed. No TV reception(they have some DVDs, but you may want to bring some of your own), no internet, spotty cell coverage - especially for AT&T. Verizon is a little better for calls, but a Verizon hotspot was intermittent at best. One bathroom and one master bedroom and a big loft and community bedroom makes it great for one family, but multiple families may find the layout challenging as one set of parents would have to sleep with the kids. Relatively close to Cannon Mountain Ski area. Wendle's Deli & Cafe in Franconia is a great breakfast/lunch place. Overall a very nice place to get away. Thanks again & always Al. 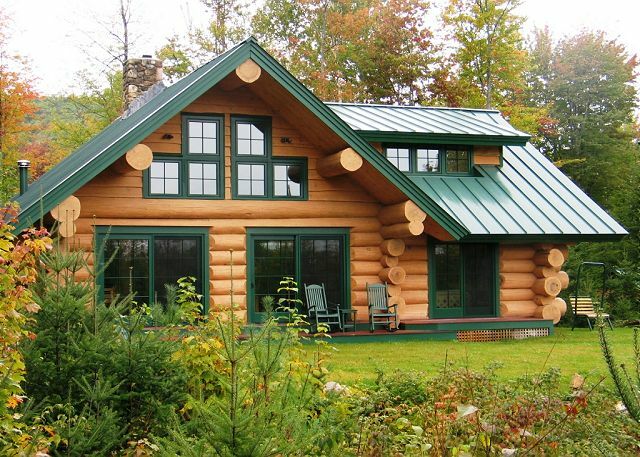 Best log home rental in Lafayette N.H. Excellent place to stay to visit Mount Lafayette area. The house is very clean and comfortable. We were only here for three days, but it was just the right size for two couples. Superb view, comfy living room, even did some cooking! But if you have an AT&T cell phone, don't expect much service. This house and location are beautiful, peaceful and private. The woodwork is unbelievably gorgeous. From one "Tree House" to another, thanks always Vicki and see you again soon! I recently stayed at the Eaglet Log Home with 6 friends and we had a great ski weekend. The pictures online did not give the home justice, as it was much bigger and nicer inside than we expected. The rental agency was also a pleasure to work with. All in all this was the perfect escape from the city we were looking for and we can't wait to return next year. A very cool mountain home experience with an awesome view! However, if you want cable, internet, and phone access, think again! 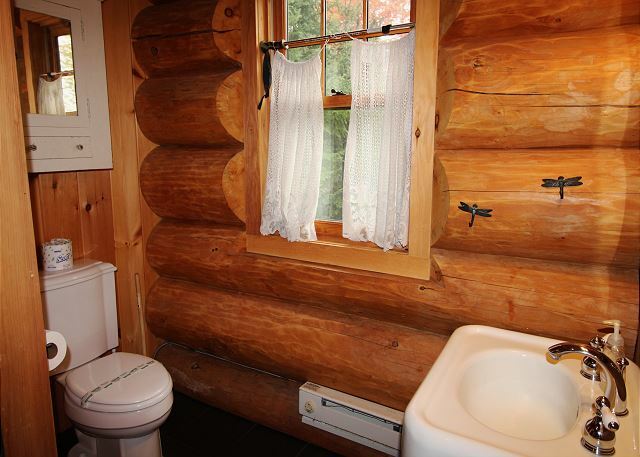 I've always wanted to stay in a log cabin. Now that I have, I want one! Really, Beautiful view. Beautiful home. Great location. Great stay. Thank you. A very pleasant experience. Our annual hike weekend was indeed a success. Thank You. We're hoping to book another mini vacation at this location before years end. We will without a doubt be back... this time w/ friends. Cort from Franconia Notch Vacations hit the nail on the head when I told him I wanted something special for my 15th wedding anniversary. ;) We're at our happiest when you are feeling the same... Glad we hit the mark as we had hoped!! 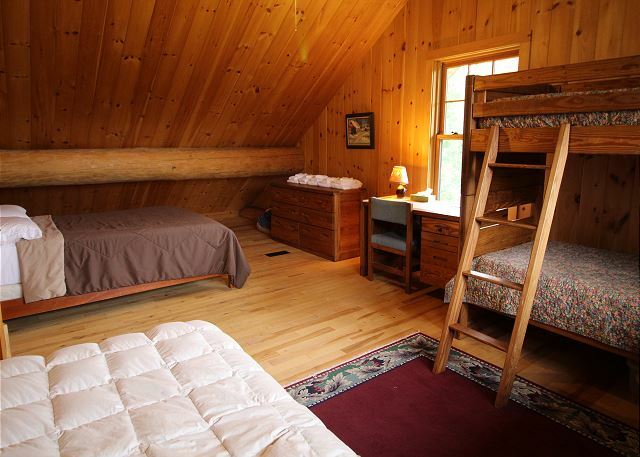 We love The Eaglet cabin! The location is great and the views are stunning! This was our second stay in this cabin and it won't be our last. 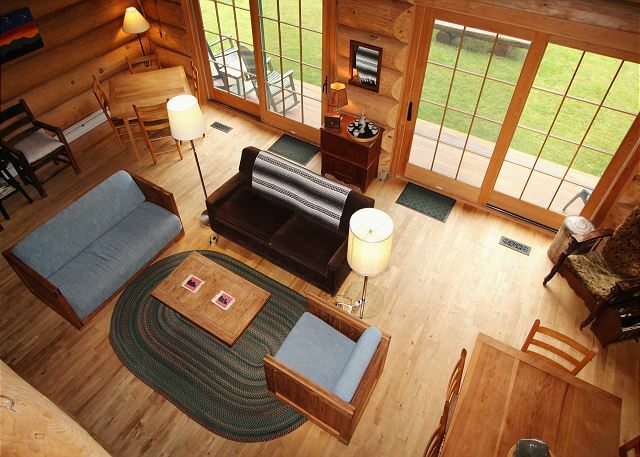 A true log cabin experience with great amenities! We stayed 4 days/3 nights and had the time of our life. Skied all day then back to the log cabin to enjoy the fire, dinner, and games. 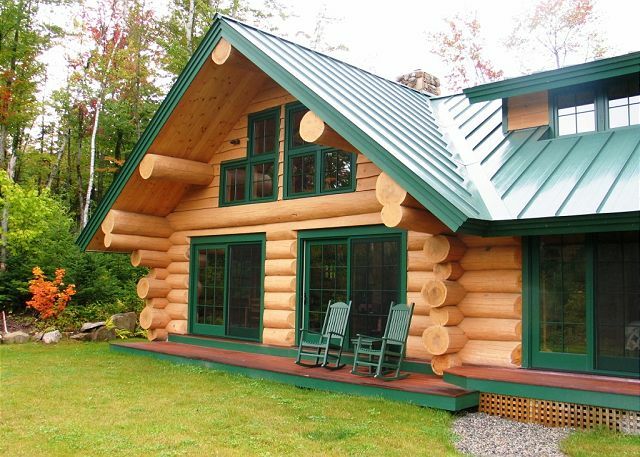 The cabin has alot of fabulous intricacies and detail work in it. The owner put his heart into making this place a dream. We plan on going back next year! 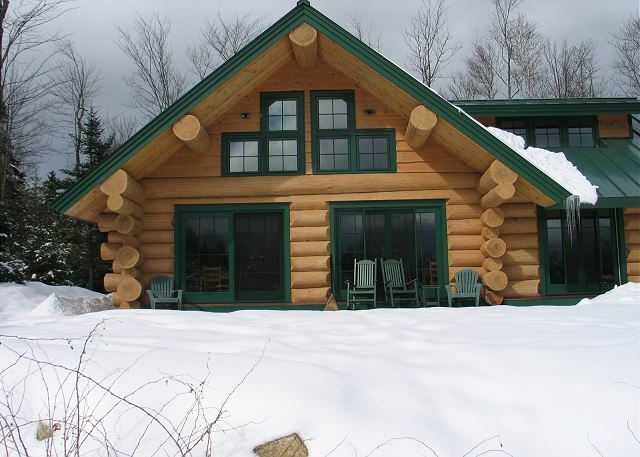 Summer, spring, winter or fall... Franconia's Eaglet Log Home satisfies all! Yet another happy set guests. Thanks again MC-W! What a beautiful home. 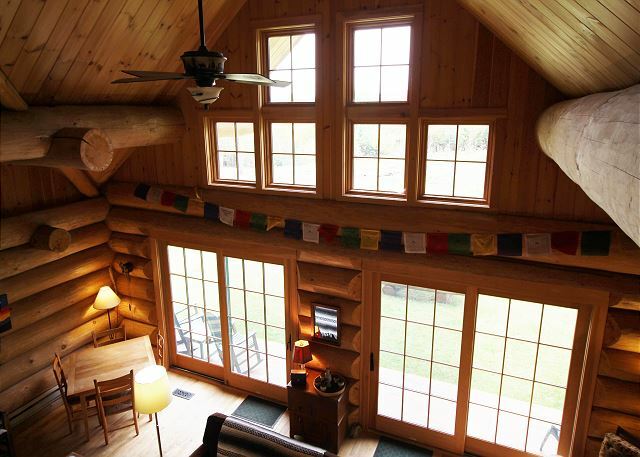 Spacious log home, great place to hang out with family and friends. The pictures on the website show it well. And what a view of Cannon Mt and Mt Lafayette. It feels like you're far, far away from everyday life. And isn't that the point of a vacation? Loved staying here. The view was amazing. 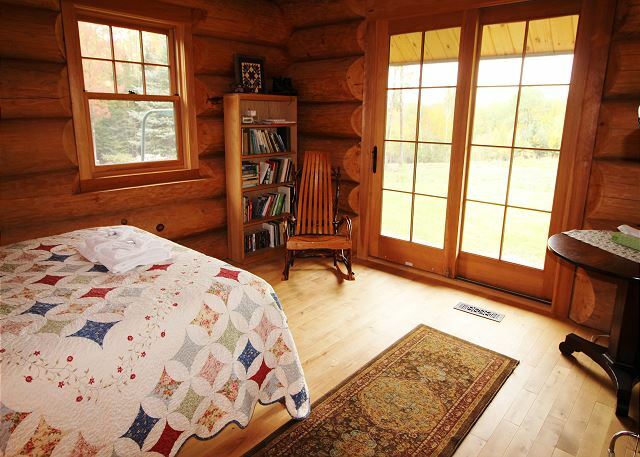 The cabin is charming and cozy. I plan on recommended it to some friends. A fairy tale log house in a fab location with wonderful views. Very peaceful and quiet.